Riverside Bank (formerly known as Merchants & Planters Bank) was chartered in Sparkman (Dallas County) Arkansas in 1916. 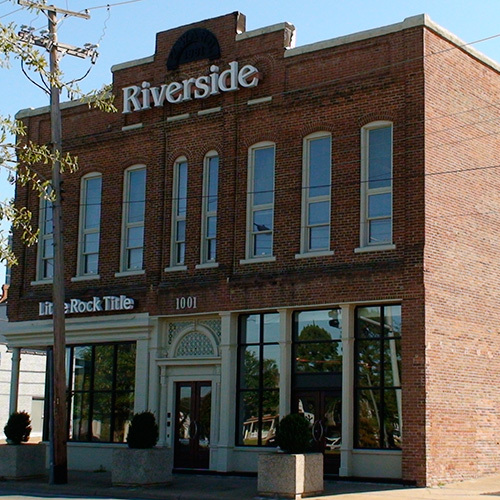 Eighty years later, in 1996, the Bank expanded into Central Arkansas with a loan production office and mortgage company subsidiary (Riverside Mortgage Company). In 2004, the Bank continued its growth with the addition of a title insurance company (Little Rock Title Company), and added another mortgage production office in Fayetteville in 2006. Our second retail banking branch was added in Little Rock in 2007. What makes our Bank so different from the other zillion banks you see on every street corner? A loan committee that meets 24/7 to get you lightning fast answers. Efficient overhead that results in high deposit rates for our customers. We are building savings, not sticks and brick branches. Focused on Custom Mortgage Loans that can only be provided by a nimble bank with closely held ownership and few decision makers. We offer small Hometown banking with Big Bank products and services and state-of-the-art technology.